Rohan Dennis (born 28 May 1990) is an Australian professional road racing cyclist, who currently rides for UCI WorldTeam Bahrain–Merida. Dennis was born, raised, and resides in Adelaide, South Australia, Australia. Dennis began his career by focusing on the track, and was part of the Australian team that took the silver medals in the team pursuit at the 2012 Summer Olympics. He joined Garmin–Sharp for the 2013 season, and made his debut Tour de France, pulling out of the race before Stage 9. In 2014, Dennis finished second overall behind Bradley Wiggins at the Tour of California, after placing second to Wiggins in the time trial. He also placed second in the Commonwealth Games time trial behind England's Alex Dowsett. In August 2014, Dennis made a rare mid-season transfer to the BMC Racing Team. He went on to win the World team time trial championships with his new team. On 8 February 2015, he set a new hour record of 52.491 km, beating Matthias Brändle's record by over 600 metres. The record stood until 2 May 2015, when it was broken by Dowsett. Dennis was selected to ride the 2015 Tour de France as part of the CCC Team squad supporting Tejay van Garderen. He won stage one's individual time trial, clocking an average speed of 55.446 km/h (34.5 mph) and became the first yellow jersey wearer of the Tour. With this performance, he established a new record average speed for an individual time trial at the Tour de France. He won the Sir Hubert Opperman medal and trophy for Australia's best all-round cyclist in 2015. He was named in the start list for the 2017 Giro d'Italia, however he abandoned his Giro on the 4th stage after injuries due to a crash on stage 2. Subsequently at the 2017 Vuelta a España, Dennis crossed the line first as part of the BMC squad that won the race's opening team time trial, taking the race leader's red jersey and becoming the first Australian to lead the race since Michael Matthews in 2014. At the 2018 Giro d'Italia, Dennis was narrowly defeated in the opening time trial by Tom Dumoulin. However, he took the pink jersey on the second stage by picking up a time bonus in an intermediate sprint. In doing so, he became the first Australian to lead the Giro since Simon Clarke in 2015, and the third Australian to wear the leader's jersey in all three Grand Tours, after Bradley McGee and Cadel Evans. He went on to win the stage 16 time trial and finished the race in 16th place overall, 56 minutes and 7 seconds down on winner Chris Froome. In August 2018, it was announced that Dennis would join Bahrain–Merida in 2019 on a two-year deal, making the move from BMC alongside team-mates Damiano Caruso and Dylan Teuns. When he won the first stage at the 2018 Vuelta a España he became the 95th rider in history to have won at least one stage in all three Grand Tours, and the 15th rider to have won an individual time trial at each Grand Tour. He went on to win the stage 16 time trial, and left the Vuelta immediately after to prepare for the World Championships in Innsbruck, winning the individual time trial title by over a minute ahead of defending champion Tom Dumoulin of the Netherlands. He also helped his BMC team win the bronze medal in the team time trial event. At the end of 2018, he won two major Australian awards: Australian Institute of Sport Performance Awards - Male Athlete of the Year and Cycling Australia's Sir Hubert Opperman Medal, which he had previously won in 2015. ^ "Dennis to ride Vuelta a España for BMC after leaving Garmin - Cyclingnews.com". ^ "RIDER PROFILES ROHAN DENNIS". Cycling Australia. Retrieved 4 July 2015. 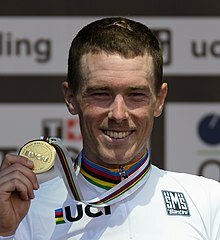 ^ "Rohan Dennis at Garmin-Sharp". Garmin–Sharp. Boulder, Colorado: Slipstream Sports LLC. 28 December 2012. Archived from the original on 30 June 2013. Retrieved 6 January 2013. ^ "Olympics 2016 – Olympics 2016 Live Scores – Olympics 2016 Results". ^ "Rohan Dennis pulls out of debut Tour de France a day earlier than planned". Velonation. 7 July 2013. Retrieved 4 July 2015. ^ "Bittersweet silver for Dennis in the Commonwealth Games - Cyclingnews.com". ^ "Rohan Dennis sets new Hour Record". cyclingnews.com. 8 February 2015. Retrieved 8 February 2015. ^ "Alex Dowsett sets new Hour Record of 52.937km". cyclingnews.com. 2 May 2015. Retrieved 2 May 2015. ^ "Tour de France: BMC Racing announce team to support van Garderen". cyclingnews.com. 24 June 2015. Retrieved 4 July 2015. ^ Wynn, Nigel (4 July 2015). "Rohan Dennis beats Boardman's Tour de France time trial speed record". Cycling Weekly. Time Inc. UK. Retrieved 4 July 2015. ^ Zeb, Woodpower (4 July 2015). "Tour de France: Dennis sets record speed to claim first maillot jaune in Utrecht". Cyclingnews.com. Immediate Media Company. Retrieved 4 July 2015. ^ "Rohan Dennis wins the 'Oppy' as Australian cycling's best in 2015". ABC News. 13 November 2015. Retrieved 1 June 2016. ^ "2017: 100th Giro d'Italia: Start List". Pro Cycling Stats. Retrieved 2 May 2017. ^ a b Fotheringham, Alasdair (5 May 2018). "Dennis nets Giro d'Italia lead with time-bonus sprint". cyclingnews.com. Retrieved 2 September 2018. ^ Fotheringham, Alasdair (21 August 2017). "Dennis takes second Grand Tour lead of career in 2017 Vuelta". cyclingnews.com. Retrieved 2 September 2018. ^ "Dennis: This Giro d'Italia was a big step forward for me". cyclingnews.com. 28 May 2018. Retrieved 2 September 2018. ^ "Bahrain-Merida confirm signing of Rohan Dennis". cyclingnews.com. 9 August 2018. Retrieved 2 September 2018. ^ "Vuelta a Espana 2018: Stage 1 Results | Cyclingnews.com". Cyclingnews.com. Retrieved 1 September 2018. ^ "Dennis wins the Oppy for a second time". SBS Website. Retrieved 13 December 2018. Wikimedia Commons has media related to Rohan Dennis. Riders in italics took part in the qualifying rounds.